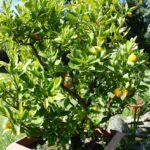 I have had my kumquat tree for almost 5 years. The first year we had fruit and then the next three years nothing. This year we had fruit some ripened but most fell off. My husband notified in the yard today that there was hard seeds all under the tree. Could the fruit that didn’t produce fall off turn and into a seed? It would not contain viable seeds. It is only the hardened shell of a fallen fruit. This is likely caused by a lack of phosphorus and potassium, or too much nitrogen in the soil. You can counteract this by adding phosphorus and potassium, or by raising the pH of the soil a little with dolomitic lime.